In a letter to the Office of the National Coordinator (ONC) for Health IT’s National Coordinator, Don Rucker, the Pew Charitable Trusts (PEW) as well as several other healthcare organizations urged ONC to “consider and incorporate improvements to safety” — especially with pediatric EHR software – as they implement provisions from the 21st Century Cures Act. EHRs can contribute to medical errors, especially with children, for several reasons, the letter said. One example is that a child’s weight affects the dose of medication prescribed and taken by the pediatric patient. 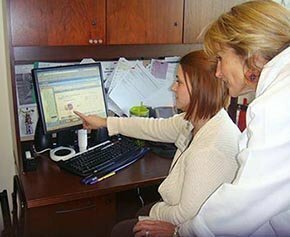 Healthcare clinicians review patient EHR data. The letter emphasizes that correctly tracking a pediatric patient’s height, weight and other vital indicators is not only necessary to make sure children are within normal ranges, but to also ensure that clinicians don’t make care decisions with a negative impact. ONC requires EHR developers to test their product to ensure certification requirements are met. However, ONC’s certification requirements are not specific to the pediatric population, the letter said. “The development of voluntary certification criteria for pediatric EHRs—as required by Section 4001 of the 21st Century Cures Act within two years (end of 2018)—offers ONC an opportunity to focus on improving the safety and usability of these health record systems,” the letter said. Through this voluntary program, the criteria developed should include provisions to detect potential safety concerns before an EHR system is installed and used, and also after implementation to identify any challenges, the letter said. These challenges would also include the need for customization depending on the healthcare facility. The letter suggests ONC look to standards, measures and testing and assessments laid out by the National Quality Forum, a nonprofit organization dedicated to improving the quality of healthcare in the U.S., and The Leapfrog Group, an organization dedicated to safety, quality and affordability of healthcare in the U.S.